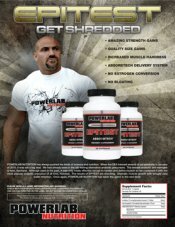 PowerLab Nutrition Halotest-25 Get It Now! YOU MUST BE AT LEAST 21 YEARS OF AGE TO PURCHASE HALOTEST-25. Sustained Release Halotest-25 by Powerlab Nutrition. The most potent Proto-Hormone to hit the market, Halotest-25 will give you the size and strength gains you didn’t think was possible. With the 25mg per capsule Halotest matrix, Powerlab Nutrition has taken the hassles out of scoring tablets and messing around with pill cutters by providing a dosage that can be controlled more effectively. 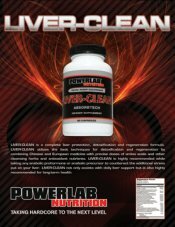 Powerlab Nutrition has incorporated ABSORBTECH technology along with the sustained release formula to give maximum absorption into the bloodstream. What Does Halotest-25 Offer You? 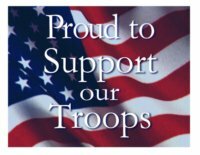 ·	Active compound does not aromatize/convert to estrogen = low side effect profile! If you're not currently satisfied with how quickly your results from training are coming along - perhaps you've even hit a plateau you need to break through - then you know that if you don't make a change things aren't going to be any different one, two or even three months from now. Clearly, you must do something different - try something new - if you want a different result. A better result. If you want to reach the next level. If you want that competitive edge. 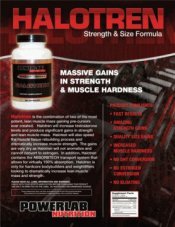 While we all have our own reasons for needing more strength, size/muscle mass and our own ideas about what that specifically means - the bottom line is that Halotest-25 can help you get there - and faster! So, consider what would happen if you could make gains each week - each month. If you're reading this then chances are you're already doing the hard part - training hard and eating for growth/strength - so why not have more to show for your efforts? Ingredient / Active Compound Details - What's in it & how does it work? At this point you're probably wondering how Halotest-25 can produce the results you've just read about - and still be legal! Well, that's a good question. Back in 2006 the FDA told manufacturers not to make any more 50mg tablets of a very similar version of this compound because it was deemed an anabolic steroid. However, the compound in Halotest-25 was never actually classified as an illegal steroid. So, PowerLab Nutrition has been able to comply with the ruling and offer this product - a proven, potent compound in 25mg capsules, taken just twice per day (total of 2 capsules/day) and in a sustained release formula! Yes, it's very similar to the now banned compound found in Halodrol-50 - enough to surely be considered a comparable replacement - but not exactly the same chemical and it's a bit stronger in fact (producing more gains) than the compound in Halodrol-50. What compound are we talking about? Halotest-25 contains 4-chloro-17a-methyl-andro-4-ene3, 17b-diol. As you may recall, Halodrol-50 contained 4-chloro-17a-methyl-andro-1,4-diene-3,17b-diol. Again, very similar, but not the exact same thing. Here's what you need to know about the compound in Halotest-25 - because of the 4-chloro alteration, the compound will not aromatize into estrogen. This has the favorable effect of reducing side effects and keeping water retention/bloating to a minimum. Additionally this alteration means that it will not aromatize into DHT - the hormone responsible for such unpleasant effects such as hair loss. 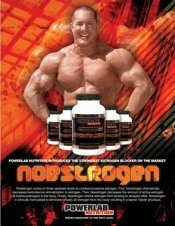 Alright, so, how does this compound help with muscle growth? Well, just like testosterone, the compound binds to muscle cell receptor sites and causes a significant increase in protein synthesis - leading to muscle cell growth/hypertrophy! Additionally, it exhibits anti-catabolic properties - reducing the effects of cortisol - leading to less protein loss from your muscle cells. 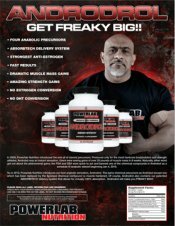 Muscle growth is induced because the anabolic effects (protein synthesis) exceed the catabolic effects (cortisol induced protein release from your muscle cells) - the difference between these two forces is now much greater with Halotest - and anabolic effects dramatically enhanced - so, your muscle growth is much greater! 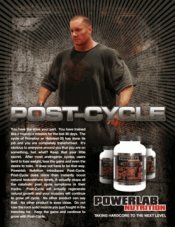 So, with the 25mg per capsule Halotest-25 matrix, Powerlab has improved on Halodrol-50 - providing a more effective compound and taking the hassles out of scoring tablets and messing around with pill cutters - providing a dosage that can be controlled more effectively...along with the sustained release formula...ensuring you get maximum absorption into your system and making a lesser dosage more potent - helping you achieve maximum results! · How do I take it? Follow the instructions and precautions listed on the bottle. Take 1 capsule twice daily - for a total of 2 capsules/day - a single bottle will provide you with a full 30 day supply at this dosage. · Are there any side effects to be aware of? Halotest-25 is only intended for use by those 18 years of age or older. As discussed above, if you follow the manufacturer's directions they should be minimal if any - some may notice they have more oily skin which may lead to a few blemishes/zits - this is temporary and will go away after you discontinue use. · What about drug tests? Will I test positive for steroids with this stuff? Although Halotest-25 is legal, we DO NOT recommend it for athletes. Professional and amateur athletes subject to performance enhancing substance testing should consult with their sanctioning body BEFORE ordering/using this product as it may be banned by your particular organization (again, although it is legal) - and cause a positive drug test result. We strongly recommend you also get a bottle of Post-Cycle to use after you finish your bottle of Halotest-25. You will be glad you did as you'll not only ensure you keep your hard-earned gains BUT ALSO you'll continue to make gains after! Do not use Halotest-25 for more than 8 weeks continuously.